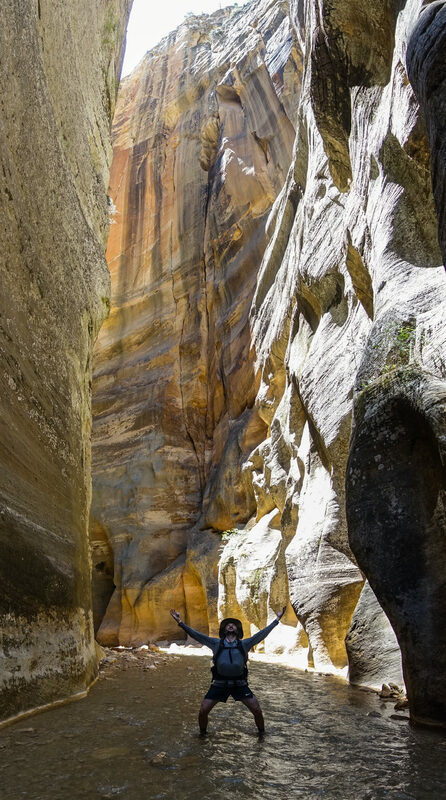 One of the nation’s deepest and longest slot canyons, and also one of the most popular hikes in Zion National Park, The Narrows is the consummate epic adventure. Few things compare to hiking 16 miles through a narrowing natural hallway while angling shinbones against stealth currents and feet atop slippery rocks and mud. Ambitious, river-fording-experienced hikers can do all 16 miles in a very long day, but the best way to experience the iconic canyon’s spectacular beauty and solitude is to spend a night. 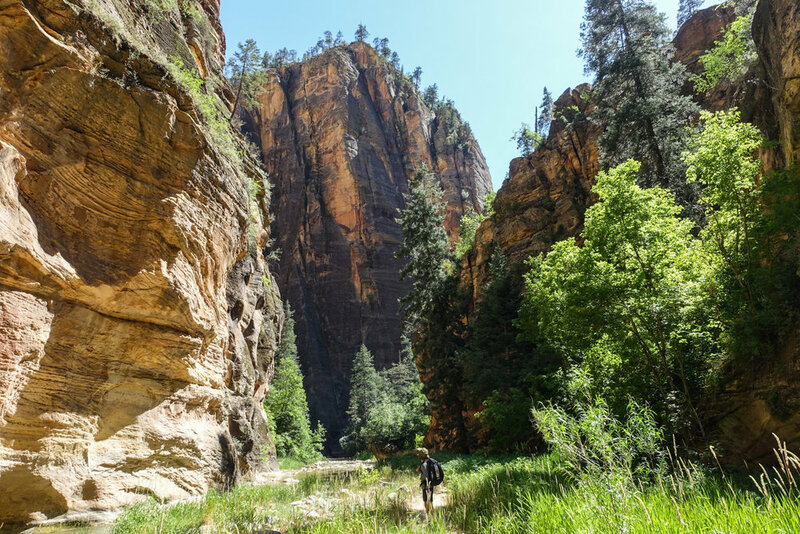 The best of the route comes on Day 2, where sheer walls of sandstone reach thousands of feet above the North Fork of the Virgin River, framing blue slivers of sky and lush hanging gardens of fern, moss and monkey flowers. 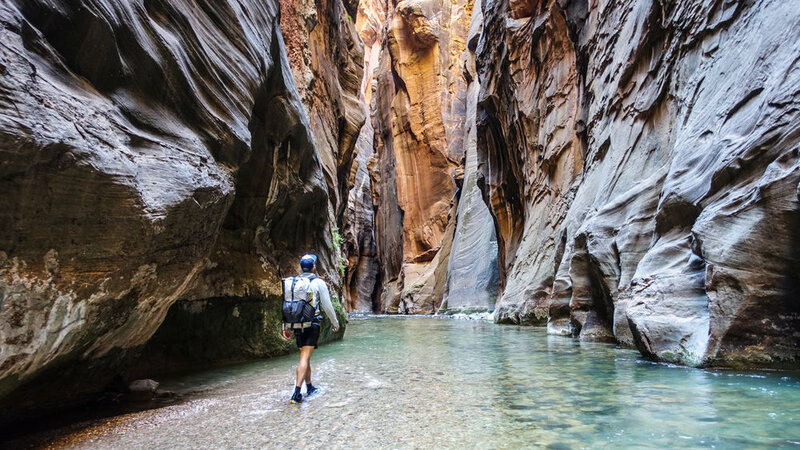 The very best times to visit The Narrows is mid-April to June and late September to mid-October when the temperatures are cooler and the risk of flash floods is lower. But for experienced hikers, who are tuned into heat risks, it’s quite doable in June through September because the river will help cool off overheated bodies. It’s also a little easier in the summer because water levels are lower, rarely breaching the knees. Flash floods are a serious concern in the Narrows that you should not take lightly. They pose a bigger risk in early and late summer and often accompany thunderstorms. It’s not unheard of for such storms to unload up to 4 inches of rain in 15 minutes. With no place to permeate, runoff collects in gullies, which overwhelms and releases into washes, and, finally, with ferocious momentum hurls down into the hallways of slot canyons. The deeper the water, the faster it runs, collects and eventually produces a life-snuffing wave that knocks down everything in its path. There’s virtually no escaping this in The Narrows. That’s why the park service automatically closes The Narrows when the National Weather Service delivers a Flash Flood Warning, and keeps it closed for two hours after the warning is lifted. Before you venture in, check water volume data at the Virgin River Flow Gauge and keep an eye on current weather, and any flash flood forecast. Permits are never issued and existing ones rescinded when flows exceed 120 cubic feet per second (unlike the 150 cfs cutoff elsewhere in Zion). Finally, keep in mind that flooding is possible at any time, and floods have occurred on days they were not forecasted. As the park service, reminds you when you get your permit, your safety is your responsibility. As always, difficulty ratings depend on your experience, physical fitness, pack weight, and weather conditions. Seasonal rainfall and snowfall significantly impact water level, which fluctuates daily, weekly, monthly and yearly. The Narrows is mostly a moderately difficult trip when the river is running below 70 cubic feet per second (CFS). Most fords are knee deep but also across slippery, uneven river bottoms with occasional pools up to waist deep. Above 70 CFS, particularly walking against the current, crossings get much more difficult. As always, know your limitations, brush up on your skills, and dial in your lightweight gear. Doing so will make for a safe and enjoyable adventure. Whether you plan to day hike or backpack, you need a wilderness permit for any travel above Big Spring, which is just under half way up the main gorge of The Narrows. Zion National Park releases half of all available Narrows permits for advance reservations via a calendar reservation system. Reservations are available online, for a $5 fee, up to three months in advance of your trip date and become available the fifth day of every month at 10am Mountain Time. So for a trip in June, you can look for permits starting April 5, in July on May 5, and so one. For a more last-minute option, you can try to make a reservation (until 5pm MT) on the day before your trip, if a permit is still available for your desire entry day. When day trips are fully booked up through the aforementioned Calendar Reservations system, the Last Minute Drawing becomes an option. To get one, submit an online application to obtain any remaining reservations for permits. Requests can be submitted as early as one week prior to a trip date until two days before at noon MT. The drawing is held at 1pm MT, two days before a trip date. Any spaces not taken through the drawing will be available as Walk-in Permits the day before a trip date. The Last Minute Drawing is limited to one request per person. If spaces still remain after the Last Minute Drawing, Walk-in Permits become available one day in advance of your desired trip. Most backpacking sites are also available as walk-in permits and are obtained at park visitor centers the day before your trip. Frequent visitors to Zion should consider enrolling in the Zion Express Membership. It allows members who have obtained a reservation to convert it to a permit online, three days before their trip. There’s no cost to enroll, no waiting in line to pick up permits, and reservation fees are applied to the cost of the permit. The entire flexible permit process can be completed online. Unlike starting at the bottom (Temple of Sinawava), where the first couple of miles from the trailhead are as crowded as a New York subway but the scenery is immediately gorgeous, hiking top down delivers untold dividends in solitude along with mile after mile of sheer jaw-dropping beauty. Chamberlin Ranch trailhead - The 3-mile hike into the actual “Narrows” starts just south of the Virgin River after a brief stream crossing (just past the Narrows information sign). It’s a straightforward route through the fairly desolate arid pasturelands of the privately held Chamberlain Ranch. The dirt road route is bordered by a desert forest of juniper and piñon pine and lined with electric fences holding back grazing cows. At 2.5 miles, you’ll encounter an old dilapidated homestead called Bulloch's Cabin. From there, go about 200 yards further and take one of the trails heading eastward toward the stream—there’re a scattering of trails, but all eventually lead into the stream bed of the North Fork of the Virgin River. At this point, it'll be clear that you're entering the canyon, and before long the walls began to rise. From here on out, you’re in and out of water for the next 13 miles. Mile 6.45 -Here’s where the constricting walls give the Narrows its eponymous name as the route begins to traverse river and riverbank. In places here in the Upper Narrows, you can reach out and touch both walls of the narrowing gorge. The route here mostly only requires short fords and follows a well-defined trail along the riverbank. Mile 8.66 - Just upstream of this mileage, you’ll work your way around a sketchy feeling traverse by a cascading waterfall, and then finally arrive at the confluence of Deep Creek, one of the North Fork of the Virgin River’s most significant tributaries and where water levels and CFS increase. The water volume, in fact, increases about three-fold. This means deeper crossings, and more challenging currents. Mile 10.68 - Just below the confluence of Goose Creek, things get even more challenging. Expect a slower pace as pools deepen, detours steepen and slick down climbs impede speedy foot travel. Mile 11.31 - You’ve arrived at Big Spring. From this point on, until you reach Orderville Canyon confluence two miles later, you’re in the water continually, sometimes up to your chest and, sometimes possibly swimming. This is easily the most dangerous part of the hike. There are few high ground escapes here. 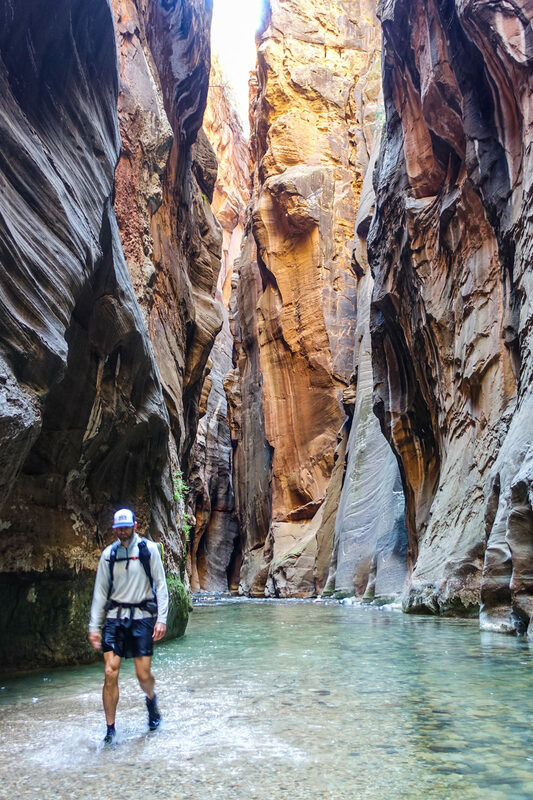 Mile 13.33 -Orderville Gulch, Mystery Canyon and Zion Stadium are where you’ll start seeing more sunlight along with hordes of day hikers. The steady uptick of people will continue to increase as you get closer to the exit at the Temple of Sinawava trailhead. The good/bad news is the level dirt trail gets a lot easier, and faster as you near the end of your adventure. Chamberlain's Ranch Trailhead (also known as the Zion Narrows Upper Trailhead) is a 1.5-hour drive from inside the park and the end of the road at the Temple of Sinawava trailhead. To get there, drive 2.5 miles east on Route 9 from Zion National Park’s East Entrance. Take a left on the paved route that goes north and continue 18 miles to a bridge that crosses the North Fork of the Virgin River. The route starts out paved but switches to gravel along the way. Just past the bridge, turn left and drive .25 miles to Chamberlain's Ranch Gate. You may need to open it, and if so, be sure to close it behind you. We don’t want to let the cows out. Drive another half-mile in and park just before the road crosses the river. Sedans can usually make it out to the ranch in dry weather, but things can get dodgy fast when the rain falls. The unpaved road gets very slick with mud. Snow closes the road out to the ranch entirely in winter. You'll need to take a shuttle service, hire someone to drive you, or take two cars and shuttle yourself to hike this route. Using two cars is the most economical, but it's also very time consuming. Commercial shuttle service is available to Chamberlain's Ranch. The fee or charge per person ranges from $25 - $40. Seating is often limited so it’s best to nail this down well in advance of your departure date. If you use the park shuttle for your exit at the Temple of Sinawava, you’ll need to leave a vehicle at the Visitor’s Center. The park shuttle is expected to begin running on weekends in February until full time service starts on in March. The seven day shuttle typically does it’s last run the final weekend of October, although a weekend shuttle sometimes run through the third week of November. We always recommend calling the Visitor Center, as shuttle availability can change year-to-year. Just before you reach Campsite 1, the river dives over a 12-foot waterfall, which you can bypass by staying left and hiking up and over a steep, narrow but well defined path. The campsite is downstream of the falls on a fairly flat spot near the Deep Creek confluence. It can be reserved in advance. Located on the right side of the river just past a waterfall about a 10-15 minute hike from the Deep Creek site. Look for a sharp bench about 10 feet above the river. It’s available for walk-up permit only. Over the next two to three miles, there are 10 more campsites located about a 10-15 minute walk downstream from each other. Keep an eye out for campsite markers as they're not all obvious. Another 10-15 minute walk and located on the right hand bench in a small stand of maple trees about 20 feet above the river. Pre-reserve or get a walk-up permit. Look for a large flat rock next to the river about 10 minutes downstream from Campsite #3. The site is up on a bench about 6 feet above the river next to the canyon wall. It’s available for walk-up permit only. About 5 minutes downstream from Flat Rock, look for a sandy area on the bench to the right just before Kolob Creek confluence. Pre-reserve or register on a walk-up basis. Also on the right about 20 feet above the river on a bench. It’s available for walk-up permit only. 10 minutes downstream from Kolob Creek, this site is located on the left on a bench about 30 feet above the river. It’s available for reservations online or on a walk-up basis. Across the river from Box Elder, around a sharp bend, follow the trail on the right up slope for about 50 feet. It’s available for walk-up permit only. This one is on the left, about a 10-minute hike beyond Boulder Camp on a 10-foot bench next to the canyon wall, also in a grove of maples. It’s easy to miss. It’s available for pre-reserve or on a walk-up basis. Located near Goose Creek, which about 1.3 miles past the confluence with Kolob Creek, and only 5 minutes from Left Bench, this campsite sits on a high bank on a westward bend of the river. It’s available for walk-up permit only. The sunniest of all the sites, it’s up a slope 10 feet above the river on the left side, immediately after the first stream crossing. It’s available for walk-up permit only. Travel another 15-20 minute (it’s a particularly challenging route) to find the next campsite, which is about 300 yards upstream from Big Spring. Look up on the left side of the river to a 25-foot high bench featuring a stand of maple and Douglas fir. Keep in mind that Big Springs is also the typical turnaround spot for day hikers coming up from the Temple of Sinawava. The site can be pre-reserved or permitted on a walk-up basis. You could choose to walk the entire length of the Narrows in one day, though calling it a grueling undertaking would be an understatement. In the best of conditions for experienced hikers, it will take you about 12 hours to cover the 16-mile route. Wilderness permits are required to enter and hike the Narrows, and as with overnights, they are not issued when the flow is 120 cfs or greater. You’ll still need two cars or a shuttle to day hike. You won’t need a permit to hike the Narrows upstream as far as Big Spring and back, a strenuous, 10-mile round trip, all-day adventure. This option allows you to see some of the most spectacular and narrowest parts of the canyon, but you’ll miss out on the incredible solitude an overnight experience in the canyon provides. This route is very crowded during shoulder and peak season. To date, there are no specific guidebooks detailing just the Narrows. There are several regional books that cover it as part of their overall Utah or Zion National Park coverage. As far as maps go, the USGS 7.5-minute topographical maps Straight Canyon, Clear Creek Mountain and Temple of Sinawava all show The Narrows. Zion National Park Trails Illustrated Topographic Map - A highly researched and detailed 1:37,700 scale map that includes a chart detailing the extraordinary geology of Zion and a companion hiking timetable for The Narrows. It also has information on trailheads, campsites and mileage. (Bonus: Every Trails Illustrated map is printed on "Backcountry Tough" waterproof, tear-resistant paper. A full UTM grid is also printed on the map to aid with GPS navigation). Lonely Planet Zion and Bryce Canyon National Parks - If you are doing more hiking in the area, this Lonely Planet guide offers in-depth information on various of hiking and backpacking options and a wealth of other useful planning tips. Water, Rock, & Time –The Geologic Story of Zion National Park by Robert L. Eves Learn how the landscape of Zion was created through the ongoing processes of geology. You’ll also learn about the main rock layers, and the role of water in carving and shaping the slot canyons, including The Narrows. We use Caltopo to research trips, plan routes, and print maps for many of our backpacking adventures. It takes a little time to learn the tool, but it's an excellent resource. We use Gaia GPS for on-trail navigation on most of our backpacking trips. We always bring a topo map and compass, but Gaia is an excellent tool in the field. GPS signals can be very hard to come by when the canyon walls are steep, but may be possible in wide sections. NPS- Plan Your Visit - Here’s a good planning primer from Zion National Park. You can also apply for permits and find up-to-date information on The Narrow’s conditions and regulations. 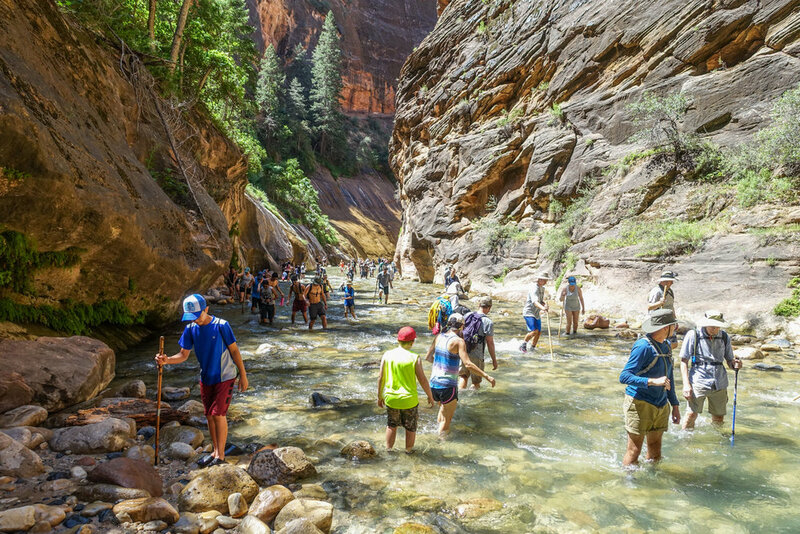 Zion’s backcountry staff recommends treating all water from the river and its springs since much of the water has passed over rangeland and may be contaminated with illness-causing pathogens. They also encourage hikers to carry in all of their water. Having said that, they also recommend drinking one gallon per person per day, which is a lot of water weight on your back. We recommend carrying a gallon to get you to Big Spring. Fill up and treat for your final day out. We often use the SteriPEN Ultra when backpacking, but in the desert we usually prefer chemical treatments. The lightest and most foolproof method is chlorine dioxide tablets or drops. If you prefer to filter your water, our top choice is the Sawyer Squeeze. Check out our water purification guide for more info and gear recommendations. 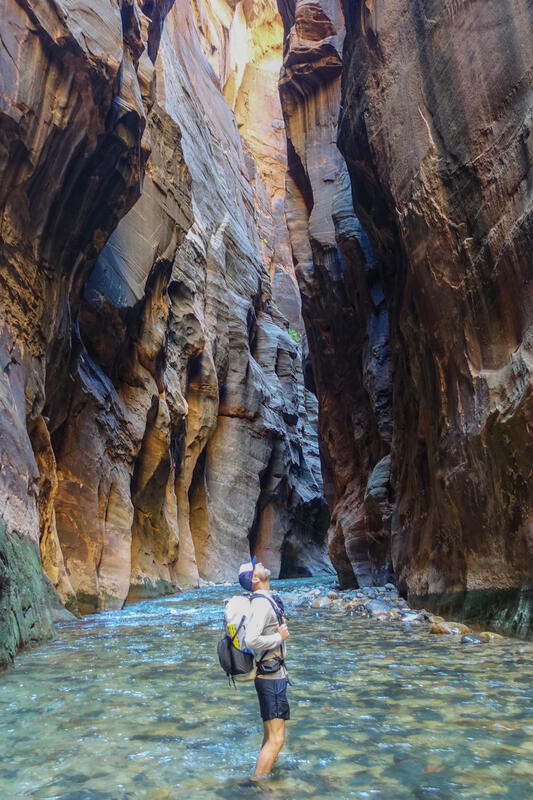 Like most slot canyons, there’s no official trail to follow through the Narrows. Instead, you’ll walk along sandy riverbanks and benches, wade through the river, and follow the curves of the canyon walls. It’s easy to follow the route as there is nowhere else to go (except if you decide to take a side trip up Deep Creek or Kolob Canyon). That being said, stay on the main stem of the river and avoid hard rights and lefts, which in most cases lead to deadend side canyons. Carrying a GPS or offline navigation like the Gaia GPS phone app is recommended. In wider sections of the canyon you might still get a connection and can plot your location. Caltopo is another excellent pre-trip mapping software that we recommend. Pee in the water, but carry human waste disposal bags to haul out your solid waste. When you pick up your permit, the backcountry staff will hand you a Restop 2 compostable human waste disposal bag. It’s the best option for protecting the Virgin River from human pollution. Also called "Wag bags," they’re easy to use and improve everyone's experience of this irreplaceable highly trafficked area. Essentially an oversized Ziploc, it contains compostable polymers that instantly break down waste and turn it into a deodorized gel. The bag is very secure as well as the most sanitary way to transport and pack out your waste. Throw it in the trash on exit. When you think about how many visitors hike in these canyons every year, and virtually no safe place to dispose of human waste, it’s pretty clear that the environment will suffer. When wag bags aren't used, campsites smell awful and water sources become contaminated. This is for the greater good and you love nature, so please do your part to preserve this special place. TENT - We used the Marmot Tungsten 2P UL for this trip. It strikes a good balance between weight, cost and livability and is included on our best lightweight backpacking tents list. BACKPACK - For this trip we used the HMG Southwest 2400 backpack. It's incredibly light and comfortable if your base weight is minimal. The HMG Southwest made our favorite lightweight backpacks list as well. SLEEPING BAG - Nighttime temperatures in the desert vary greatly depending on the season. When evening lows dip around freezing, we use the Feathered Friends Egret UL 20 Women’s Sleeping Bag and the REI Magma 10 Men’s Sleeping Bag. When nighttime lows are 40°F or higher we prefer lightweight quilts like the Enlightened Equipment Revelation. Here’s a list of our favorite lightweight sleeping bags/quilts. SLEEPING PAD - We used the Therm-a-Rest NeoAir XLite and Sea to Summit UltraLight Insulated sleeping pads on this trip. Both are light, comfortable, warm, and make our list of the best backpacking sleeping pads. COOKING SYSTEM - We used the BRS Stove, Snow Peak Mini Solo Cookset, and Snow Peak Folding Spoon on this trek, all of which make our top picks gear list and best lightweight stove list. 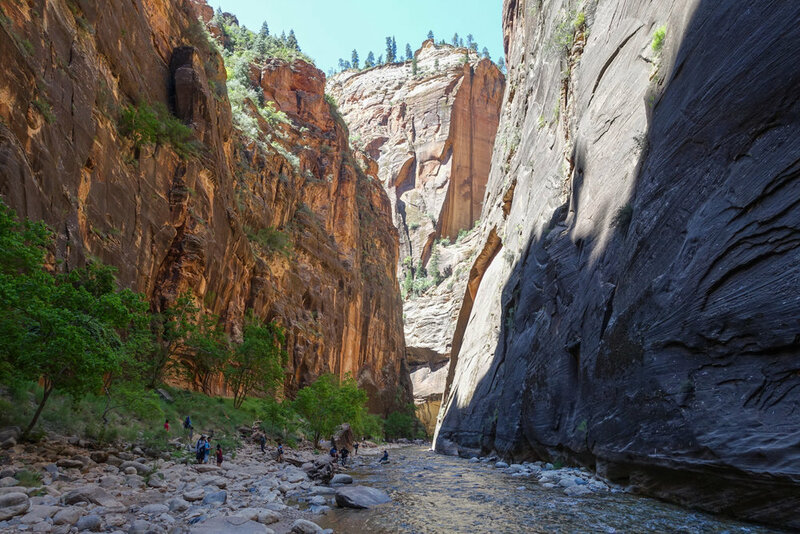 WATER PURIFIER - Zion’s backcountry staff recommends treating all water from the river and its springs since much of the water has passed over rangeland and may be contaminated with illness-causing pathogens. They also encourage hikers to carry in all of their water. If you are treating your water, we recommend the SteriPEN Ultra, chlorine dioxide tablets, or the Sawyer Squeeze. Check out our list of the best water filters for more info. WATER BLADDER - You will have to carry a lot of water along this route, so good water bladders are key. We use Platypus Platy Bottles on all our desert hikes and they hold up well over tough miles. SHOES OR BOOTS - Footwear is a somewhat complicated choice for this trip. You'll be spending a good portion of this hike in water and your shoes will be wet for the entire trip. Footing is the biggest challenge in riverbeds and on the steep banks along the river. Also, water temperature at certain times of the year can be very cold, so 2-3mm neoprene socks are highly recommended. 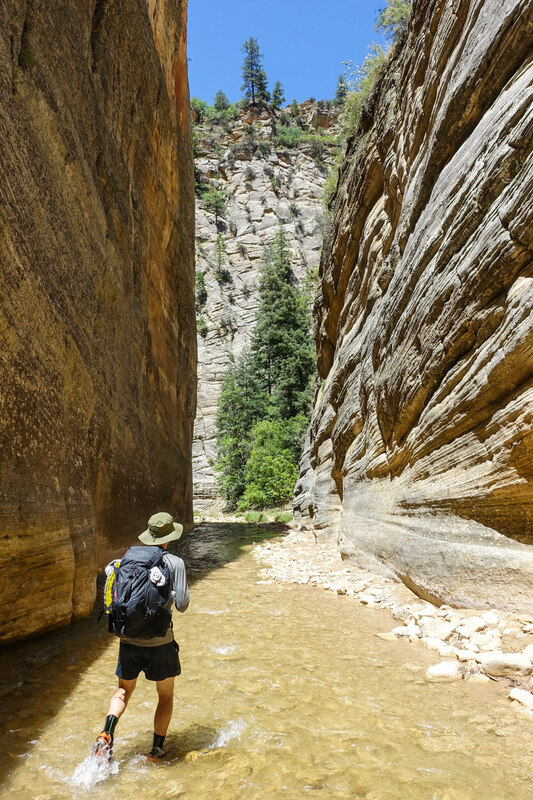 Because of the slick and rocky riverbeds, many hikers prefer sturdy, lightweight drainable canyoneering boots (example) with ankle support and lugs for traction. It's uncommon for hikers to own this specific type of footwear, so many rent them from one of the gear equipment shops in Springdale before their trip. If you have strong ankles, tough feet, and lots of river fording experience, it's also possible to hike this trip in trail running shoes, but that's a personal choice. 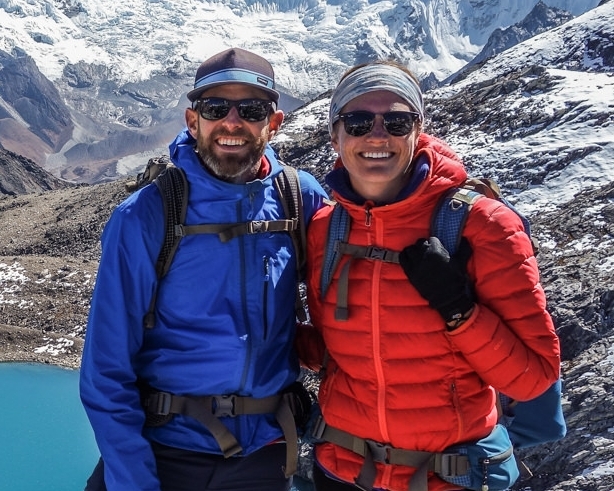 We hiked this trip in trail runners with neoprene water socks to help keep our feet warm and it worked out well for us. Check out our best backpacking footwear list for more info. We would definitely not recommend hiking this route in open-toe sandals, though some do. 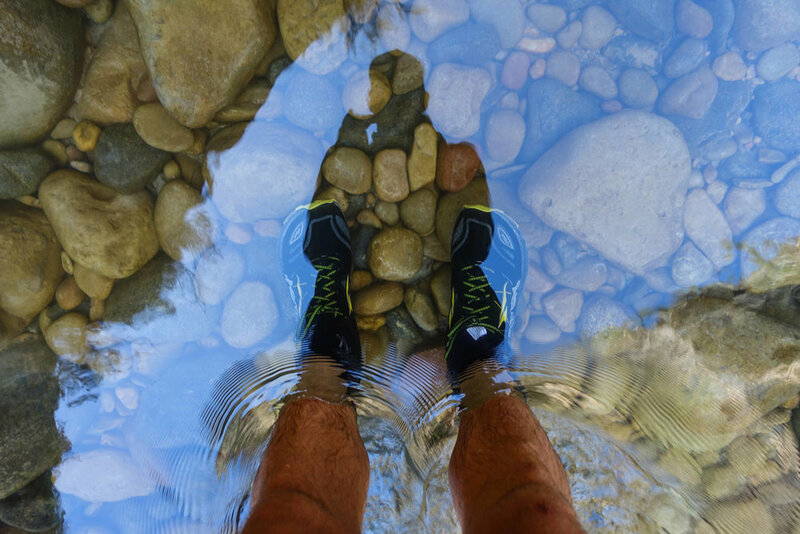 In our opinion, you'll at very least want closed-toe trail running shoes to protect your feet from getting torn up on the river rocks. HEADLAMP - We used the Petzl Actik on this trip, which is an affordable, bright, and lightweight option. FOOD - When backpacking in The Narrows you'll have to carry all your food. For some suggestions on common backpacking food options, check out our Lightweight Backpacking Food Guide and best freeze dried meal list. FOOD STORAGE - Although you won’t have to worry about bears, we find the Ursack Bear Bag is the most foolproof food storage method to prevent critters (mice, chipmunks, squirrels, etc.) from getting to your food. DRY BAGS - You'll be wading through and fording rivers, sometimes waist and chest deep depending on time of year, for a good portion of this trip. Very few (if any) backpacking packs are fully waterproof, so we recommend packing all your items in individual dry bags, such as HMG roll top stuff sacks and S2S eVAC Dry Sacks. CLOTHING - Regardless of daytime temperatures, warm fleece clothing is essential, as evening temperatures in the canyon can drop significantly. When you’re cold and wet, you need warm and dry clothing. Day hikers should also be prepared for the drastic temperature drops in the late afternoon and early evenings. Quick-dry clothing is essential for this trip. Forget cotton, which gets soggy and draws heat away from the body. Synthetics are your friend in The Narrows. Wool, especially hybrid merino, can be useful for keeping you warm but still takes longer to dry than synthetics. In the winter or shoulder season (as late as mid-May) you may want to consider renting a dry suit. MAP & COMPASS - We used Gaia GPS phone app and Caltopo in planning our trip and printing maps. We also carried the Zion National Park Trails Illustrated Topographic Map. In addition, we always hike with a compass too, though the route was easy to follow and we didn’t end up needing it. GPS MESSENGER - We used the Spot Gen3 GPS Messenger throughout all our backpacking trips in Utah this year. The Spot can be used to send GPS distress signals in areas without cell reception, which is excellent, but it can also be used to send pre-programed messages (email or text) to let loved ones know you’re okay. FIRST AID KIT - A small personalized first aid kit is essential. We used the .5 Ultralight Kit and added extras, like painkillers and personal medications. SUN PROTECTION - We cannot overemphasize how important it is to prepared for desert sun conditions. Sunglasses (polarized recommended), sunscreen, and spf lip balm are all critical on this trip. POCKET KNIFE - We brought along a small Swiss Army Knife which came in handy here and there. TREKKING POLES - Although we don't usually hike with trekking poles, they would be handy on this type of trip. Fording rivers will test your balance, especially moving against currents with slippery rocks underfoot. Check out some of our lightweight recommendations on our Best Trekking Poles list. SMALL TOWEL - the Nano pack towel is great. HAND SANITIZER - Always apply after using a bathroom and before eating. WET WIPES - These are useful for cleaning up after hiking. INSECT REPELLENT - Insects weren't an issue for us on this trip, but we always carry 1 oz of DEET per person and pre-treat our clothing with permethrin. CAMERA - The Sony RX100 is our go-to camera for lightweight backpacking. PROTECTIVE PHONE CASE - You will be trekking through wet, sandy, and dusty trail conditions on this trip, so a protective phone case is a good idea: LifeProof Fre phone case. We hope this guide helps you plan a fun adventure on the Top Down Narrows backpacking trip. As always, please leave a comment below if you have any recommendations, questions, or suggestions. And if you found this guide helpful, please share and click the little heart button below to give us a digital high five!